I don’t usually dip my pen into the inkwell of state politics, but I suppose it is worth noting that Texas Governor Rick Perry won the GOP nomination for Governor of the Republic of Texas. 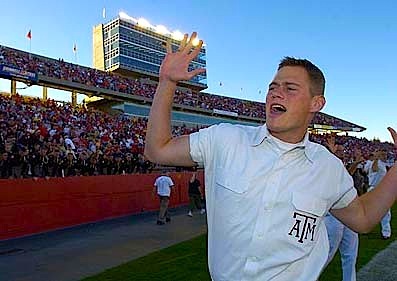 Perry was a yell leader during his time at Texas A&M during the early 70s. Yes, fellow Texans that was our Gov nearly 2 score ago. Gov. Perry handily defeated former Longhorn Sen. Kay Bailey Hutchison on an “anti-Washington” platform. Let’s see how the former yell leader stacks up in the race for the Governor’s Mansion against former H-town mayor and UT Law grad Bill White. 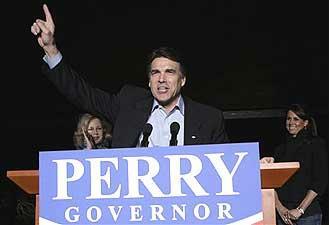 I’m not sure how big a role Rick Perry’s secessionist tendencies will play in the campaign but I am sure that Gov. Perry wants us to know that we can tell by the way he moves that he’s a ladies’ man.